We at Seasons of Smiles Dental run our own website. I have heard it suggested that it’s not usually a good idea for the dentist to make their own website. And as the years have progressed I must admit, there have been times that I was tempted to throw in the towel and go buy into one of those off the shelf dental websites. I cringe at the mistakes made while running our own dental website. Even now, there are a few rough edges that need to be worked on. But overall, looking back, I’m glad we stuck with it. I absolutely love our end product. I think it’s the BEST dental website. Dental website Design: It’s a sleeper. 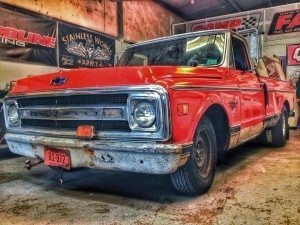 The ‘ol Farm Truck – Dental website Design: It’s a sleeper. Recently, while staying at a hotel I was watching Street Outlaws on the Discovery Channel. On the show, Sean “Farmtruck” Whitley and AZN were driving around in this old red 1970’s Chevy pickup truck. Even though the truck is painful to look at, it’s extremely fast. Check out the video snippet below. In the show, they drive around looking for “hot” cars, Corvettes, Porches and such. They will approach the drivers asking them if they want to race the ‘ol farm truck. It’s very entertaining to see the ‘ol farm truck do the unexpected. The ‘ol farm truck outperforms the slick and shiny new sports cars. I do hope our dental office website looks better than the proverbial ‘ol farm truck. I especially like the idea that it performs better than expected. We are continually tweaking our website so as to get it to perform. For example, recently our website obtained an Extended Validation SSL Certificate. What does it all mean? In short, it protects our dental website consumers. In addition to that, Google, Bing, Yahoo and Apple search engines understand the SSL certificate, and will it give our dental office website deference? I sure hope so. Check out the GoDaddy SSL seal at the bottom of this page if you’re curious to see how it works. We are continually looking for ways to make it faster. Some ideas have been incorporated, and a few ideas we are still hoping to implement. Dental Content, on the other hand, is a more challenging proposition. I realize that it’s nice to have a blazing fast, souped-up website, but what if the content is boring? How to you take the topic of dentistry and make an interesting website out of it? So, one of the most challenging parts of running our own website has been in trying to developing interesting content. I am continually reaching out to the ladies in our office collectively as a group to help by writing interesting content. Bless their hearts, they do appear to humor me by listening. I know that my office staff is passionate about health, and they are passionate about teeth. And I do know they love serving our patients. As you spend time on our website, I hope you feel our passion to give you healthier beautiful smiles and by doing this, we strive to improve your overall physical and emotional health. Happy smiles make happy hearts! That is one of the reasons we spend developing, working and maintaining our dental website. Give our office a call.